Our experienced team at Reliatex, Inc®. can customize the size and shape of any foam in stock. 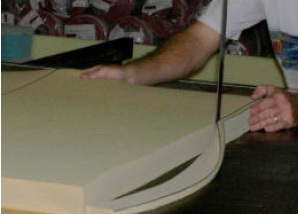 We can contour, create wedges, cut and glue the foam to the exact specifications of your project. Simply contact one of our sales people for pricing structure and details. Please see our pattern materials section of the catalog for aides to help your custom project. Density is the weight of a cubic foot of foam and is probably the most important single property to be considered by the quality-conscious foam buyer. Density in urethane foam is not a measure of firmness or softness as it is with latex foam. Among commercially available seating grade urethane foams (ILD-34 Compression Range) densities can vary from as low as 1.0# pcf for the economy foams to 1.5# – 4.6# pcf for a very high quality “all urethane” product. Resilience in foam is the measure of its liveliness or springiness. It is measured by determining the percent rebound of a steel ball dropped from a height of 36”. Along with density and load-bearing (ILD) consideration, resilience is an important measurement in judging the quality of the foam. High resilience values (54-60%) are further indication of quality. Considerably lower resilience values (35-45%) are found among the cheaper low density foams. These low values reflect the boardy or “plastic” feel of lower quality products. 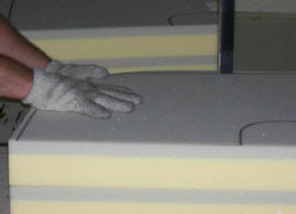 A measure of the load bearing capacity of flexible polyurethane foam. IFD is generally measured as the force (in pounds) required to compress a 50 square inch circular indentor foot into a four inch thick sample, typically 15 inches square or larger, to a stated percentage of the sample’s initial height. Common IFD values are generated at 25 and 65 percent of initial height. 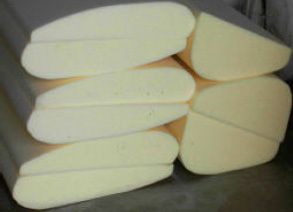 A measure of the force required to continue a tear in a foam after a split or break has been started and expressed in pounds per inch (lb./in.). 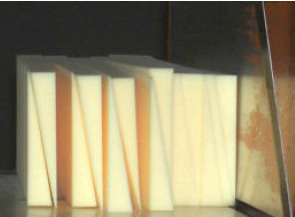 This property is important in determining suitability of foam in applications where the material is sewed, stapled, or otherwise anchored to a solid substance.